سپانلو, ابوالفتح. (1393). جاماندگی ضرورت نیست ، تاخیر عدالت است. مجله علمی-ترویجی منظر, 6(26), 44-47. ابوالفتح سپانلو. "جاماندگی ضرورت نیست ، تاخیر عدالت است". مجله علمی-ترویجی منظر, 6, 26, 1393, 44-47. سپانلو, ابوالفتح. (1393). 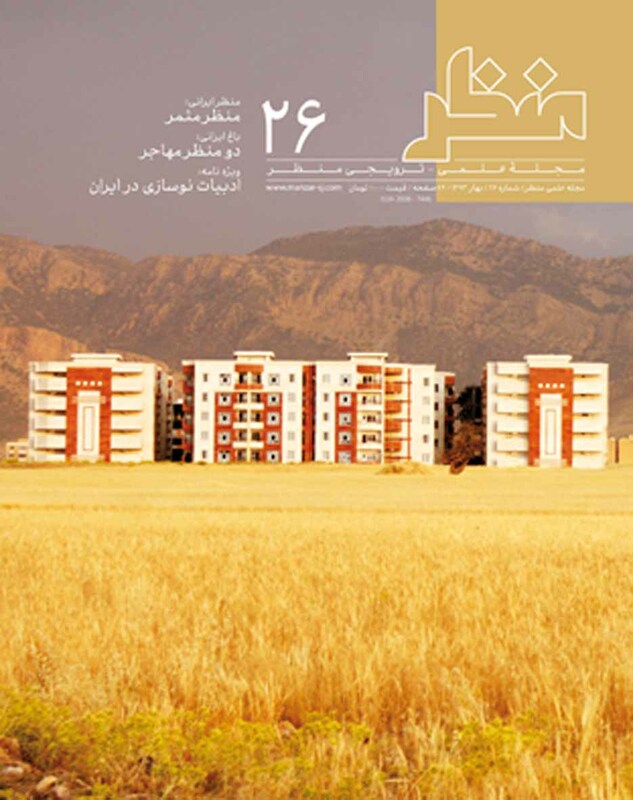 'جاماندگی ضرورت نیست ، تاخیر عدالت است', مجله علمی-ترویجی منظر, 6(26), pp. 44-47. سپانلو, ابوالفتح. جاماندگی ضرورت نیست ، تاخیر عدالت است. مجله علمی-ترویجی منظر, 1393; 6(26): 44-47. تلاش‌های چند دهه اخیر برای معاصرسازی پهنه‌های شهری جامانده تا کنون به نتیجه مورد انتظار نرسیده است. یکی از دلیل‌های این امر و شاید مهمترین آن، طرح نادرست مسئله بوده است. تعریف درست مسئله نیاز ادبیات وپژه خویش دارد تا با روشنی افکندن بر معنا و مفهوم مقوله‌های حوزه مورد نظر زمینه طرح دقیق و بیش بعدی معاصرسازی پهنه‌های شهری جامانده آماده شود. نوشته‌ی حاضر تلاشی است برای جلب توجه به ضرورت جلوگیری از آنچه جاری است و پیشنهادی در بازاندیشی تعریف مسئله "جاماندگی پهنه‌های شهری" برای جبران تاخیر تاریخی در "معاصرسازی" آنها است. M.A. in Architecture, CEO of Tarh-o- Amayesh Consultant Architects & Town Planners, Iran. Recent efforts in regeneration of lagged urban areas from late developments have not led to an acceptable result to come out of the current unpleasant situation. This indicates the inadequacy and inconsistency of program with aspects of change process. If excessive efforts to transform the current threat of lagged urban areas to urban development opportunities are far away from achieving the goal, the uncertainty of the issue will be acceptable. Therefore, returning back to the beginning of the cycle of knowing the lag and efforts to contemporize the lagged urban areas becomes a necessity. A verification of the issue requires the specific terminology of this field of study. This terminology tries to shed light on the meaning and the scope of lagged urban areas and the way of regeneration in a closely definition framework. The lagged urban areas demonstrate one or more aspect of lag including “Social abnormalities, cultural lag, psychological-health crisis, mental disorders, functional incompatibility, and the economic decline, lack of updated urban utilities, environmental pollution, motion difficulties, and decline of social prestige”. Urban areas do not have equal “living level”. “Living level” is the extent to which one can benefit from city utilities and urban amenities. The differences between "living level" in a part of "urban areas" from " is below" the “average living level”. In other words, they are “lagged” behind the developments and “lagging” is resulted from attachment or detachment to “time” that “drives changes”. Time changes in three levels of global, national and local. Every change obtains a meaning from transition from "what it is" to "what it should be" and clear definition of “what it should be” requires knowledge; the one that can help us distinguish right from wrong and offer us a clear view of the actual situation of urban areas. “Regeneration” is not a simple issue against “lagging” nor a linear compensation of it. “Regeneration”, meaning “placement of place in time” creates new spaces and flourishes on diminishing the “lagging” situation. In such a framework, the regeneration makes the city a subject of “what it should be”. In regeneration as Protagoras quotes man is the measure of all things. If so, we cannot enter the life of “measure of all things and undertake their unwilling changes with primary ways of (Renovation, rehabilitation, regeneration, restoration).